Your charter includes a regulation vessel with a fully qualified captain. Includes all fuel costs, the finest in fishing gear, Coast Guard approved life jackets, bait and tackle, ice and coolers to keep your catch fresh until the end of the trip. We supply all bedding, towels, dishes, paper towels, toilet paper, BBQ, propane, and all the condiments you will need. You must supply your own valid saltwater fishing license, warm clothing, food and beverages of your choice, personal hygiene supplies and don’t forget your sunglasses and camera. Your catch is properly packaged on ice in our coolers. It is then your responsibility to transport your catch home. You may choose to bring your own coolers for transport or coolers and ice may be purchased by you at the marina for your convenience. You may want to have it processed and vacuum packed at a local market if time permits. Contact the market for pricing. A charter usually starts at 6 pm, heading for the fishing grounds so you can have an early morning start. Crab traps are pulled on the way out so you can enjoy a feast on your first night. 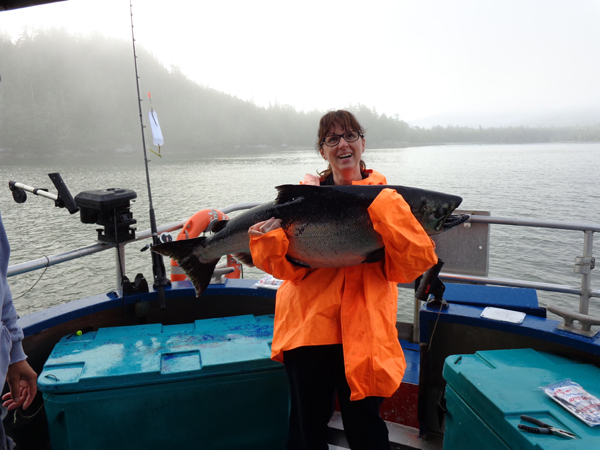 You will fish for salmon, halibut or others depending on the weather and tides. If you're not sure how to fish for a particular species, Dennis is your teacher. Your charter is tailored to what you would like to fish for or even sight seeing of whales, grizzly bears, or our fantastic scenic coast. Those choices are up to you. Your catch will be then cleaned and put on ice to stay fresh. There are also alternatives to sleeping on the vessel. There are lodges and meals available at an extra cost. You may inquire about this with Dennis when you book your charter. Payment for the charter is usually made towards the end of the charter. If the vessel is docked, money should only be transferred on the boat. This is a rule at many marinas.